31’ Camano o	Year: 2002 o	Located: Massachusetts o	Hull Material: Fiberglass o Engine/ Fuel Type: Single Diesel o Document # 1200095 o Hull WCMF-58179B202 o	Builder: Camano o	Dimensions: LOA: 31’ Draft: 3’3” Beam 10’6” o	Displacement: 10,000 lbs o	Engine: Volvo HP: 200 Hours: 790 Cruising Speed: 14.5knots Max Speed 18 knots o	Tankage Fuel: 100 gals Water: 80 gals Holding 15 Gals Accommodations Mirage III is an unusual find, maintained in impeccable condition. 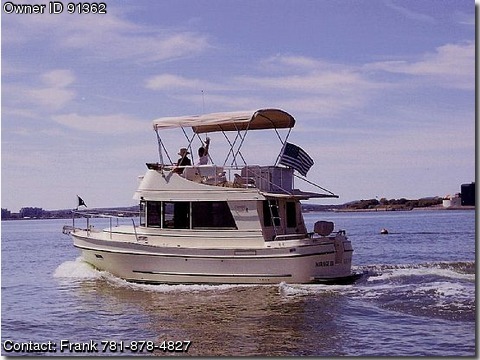 This “like new” Camano is a one stateroom, 1 head trawler with a large salon and very practical galley down one step. She entertains eight, seats six for meals, and sleeps four comfortably. With two helm stations, a large flybridge and great 360 degree visibility in the salon, she makes a wonderful one couple trawler. Head o	Electric toilet o	15 gallon holding tank w/macerator and deck pump out o	Opening Port o	Wrap around shower curtain o	Shower sump pump o	Storage cabinet o	Linen locker w/custom shelf Galley o	Force 10 (3) burner cook top w/oven and cutting o Custom fold down tray next board top	to oven o	Propane alarm	o Microwave oven o	12/110/V Freezer/Refrigerator	o Water filter on tap Salon One of the great features of the Camano is its large and very bright salon. With excellent ventilation, Marine Air 16,000 btu heat and air conditioning, and 360 degree visibility, the salon is comfortable in all conditions. The salon incorporates a stereo as well. o	Trimmed mahogany	o (2) Bookcases o	Formica counters	o (2) Shelves in berth area o Teak and holly floors	o Navigation drawer o	Dinette converts to double berth with 5” cushions	o Cutlery drawer o	5” upholstered foam mattress on forward berths	o (4) Large storage drawers with filler cushion	o Spacious hanging locker o	Side and aft curtains in salon	o Additional abundant storage o	Screen on aft door to cockpit	throughout o	Custom upholstery	o Folding helm chair o	CD player with (6) speakers Electrical o Electrical panel including meters for amps	o 30 Amp shore power and volts	connection o AC beaker panel w/polarity indicator	o 4 Duplex 110v outs (GFI o DC breaker panel w/color coded wiring	protected) o All AC and DC circuits protected by	o 9 Double dome lights – main magnetic breakers	galley and head o (5) AGM batteries w/disconnect switch	o (2) Reading lights – berth and combiner	o Factory 12V DC upgrade o Link 10 battery monitor	o Freedom 2000 o Entec 4.2 Kw generator (150 hrs)	inverter/charger o Heavy duty electrical system with (2) alternaters Engine/Mechanical Equipment Volvo Penta TAMD41 200 HP with 790 hours. The engine is spotless and reflects its well maintained condition. The mechanical layout on the Camano is well thought out with easy access to all components. Detail features include: o	2 plastic water tanks – total approx. 80 gals	o	Stainless steel 316 alloy skeg o	Pressure fresh water system	protecting prop and rudder o	110V and engine hot water heater	o	Racor fuel filtration (dual) o	2 automatic bilge pumps	w/vacuum guage o	Shower power drain pump	o	2 aluminum fuel tanks – total o	Bilge pump alarm and warning light	100 gals. o	Bronze ball valves on all underwater	o	Fuel gauge - each tank fittings	o	Dual control station with o	All under water metal bonded to zinc	2 lever control anode	o	Hydraulic steering o	4 blade bronze 20 x 20 prop – l ½ stainless	o	Stainless steering wheel at steel 316 shaft	upper station o	1 ¼” stainless steel 316 alloy rudder stock	o	Electric bow thruster 5 hp o	Electronic trim tabs	o	Flow scan 9500 fuel monitor- o	Algex 200 fuel conditioner	ing system Navigation Stations o	Saturn 3” compasses	o	Raymarine VHF radio at each	o	Full Volvo engine gauges at the lower	helm w/intercom helm	o	Twin Raymarine 4Kw radar 7” o	Volvo engine gauges also on flybridge	color displays w/chart o	(2) C-map chips (NE to NY)	plotter and depth sounder	o	Raymarine ST 5000 autopilot w/remote on bridge Main Deck Standard Equipment and features: o	No external wood for ease of maintenance	o	(2) cockpit lights o	Boarding/swim platform	o	Tinted hatch over forward o	Folding swim ladder stainless steel under	cabin w/screen platform	o	(4) opening port lights with o	Stainless steel bow rails	screens o	(8) Stainless steel 10” deck cleats	o	Stainless steel anchor roller o	Port and starboard water and fuel deck fills	o	“U” bolt for anchor line o	Waterline boot stripe	including access	o	Cabin pinstripes	o	Black vinyl side rub rails Main Deck Standard Equipment (continued) o	Self bailing cockpit	o	Black vinyl lower hull guard o	Stainless steel cockpit handrails	o	(2) Transom fender storage o	Storage area under cockpit	compartments o	Stainless Steel hand holds on aft bulkhead	o	(6) black fender cleats o	Integral anchor locker	o	Lazarette lock o	Stainless steel hand holds full length on side decks	o	Cockpit shower o	Ground tackle includes chain pipe, Bruce anchor,	o	Custom Sampson post 50’ ¼” chain, 300’ nylon rode	o	Spare fortress anchor o	Maxwell 800 electric anchor windlass	o	Magma propane grill o	International running lights	o	Folding cocktail table o	Anchor light	o	Custom cockpit bimini o	Snap davits on swim platform	o	Dinghy and motor available Flybridge o	Full second steering station	o	(3) Helm seats forward o	Saturn 3” compass	o	Instrument cover o	Bimini cover w/extension	o	Fender rack & 3 fenders o	Deck storage box	o	Seat covers Construction All laminates are hand laid mat and roving. Hull bottom is solid glass with 6 longitudinal stringers. High stress area of keel includes carbon fiber along with mat and roving to a thickness as great as 1”. Hull sides above waterline and all cabin areas are cored for stiffness as well as sound and thermal insulation. Glass content in foam cored area has sufficient strength to stand alone. Hull to deck joint is fiberglassed together along with bulkheads to form an integral structure. The highest quality fiberglass and gelcoat materials are used. Engine room area surrounded with heavy duty construction and insulated with modern sound proofing materials. •	Powder coated welded aluminum exterior swinging door •	Powder coated aluminum framed cabin windows with additional thickness safety glass (3 sliding) •	(8) Deck cleats through-bolted with aluminum backing plates. Remarks Mirage III is a great “one couple” trawler that has all the basic equipment for comfortable, long distance cruising. With her single diesel and large bow thruster, she is easy to maneuver and stingy on fuel. At 7 knots she consumes about l.5 GPH and at 14 knots about 6 GPH. She is in impeccable condition and ready to go cruising.